35 Greer Hill Drive, Ellicottville, NY.| MLS# B1006259 | Chautauqua Lake Real Estate Services. Informed, Professional Real Estate Information Serving Buyers and Sellers Interested in Lake Chautauqua Real Estate and Chautauqua County NY Real Estate. Rick and Julia McMahon Real Estate Advantage Since 1992. 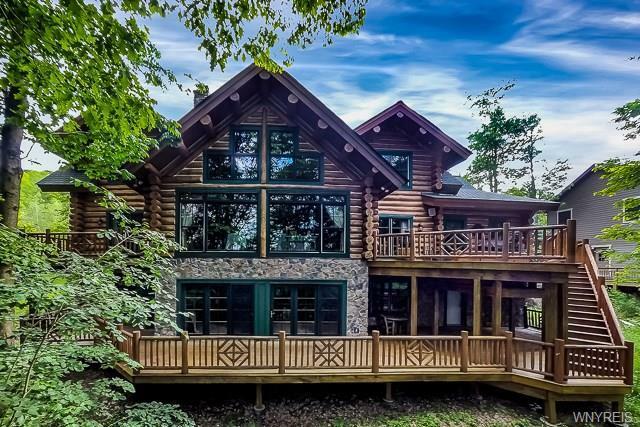 A custom Maple Island Log Home handcrafted in Michigan, with HoliMont ski in/ ski out access, and an easy walk to the village on Ellicottville's desirable Greer Hill. The home features 5000 sq ft of rustic elegance, with the warmth & ambiance of logs in every room, stairway, balcony, & multiple decks. The main level features a great room with a massive stone fireplace, a cozy master suite with soaking tub and private deck, a well designed kitchen with touches like a custom copper hood, and large wood topped island, 2 half baths, mudroom, laundry room, porch, a deck with sunken hot tub,. The 2nd level w/ balcony offers a 2nd master suite and 2 more bedrooms. The walk out level has another deck, family room with fireplace and wet bar, game room, and a 5th bedroom. Entertain YOUR crowd here! Directions To Property: Rte 219 South Into The Village Of Ellicottviile. At The Single Traffic Ligth, Intersection Of Rte 219 South And Rte 242, Continue Straight Through Light And Travel Around The Curve On Rte 242 - Look For Greer Hill Dr On Left.